Sometimes theater is more than just theater. Sometimes theater is about giving a voice to people whose voices are not often heard. Sometimes theater is about increasing our understanding of people who seem different than us, but who really are the same. Sometimes theater is about giving everyone a chance to see their lives and experiences reflected back at them, validating their existence and importance in the world. 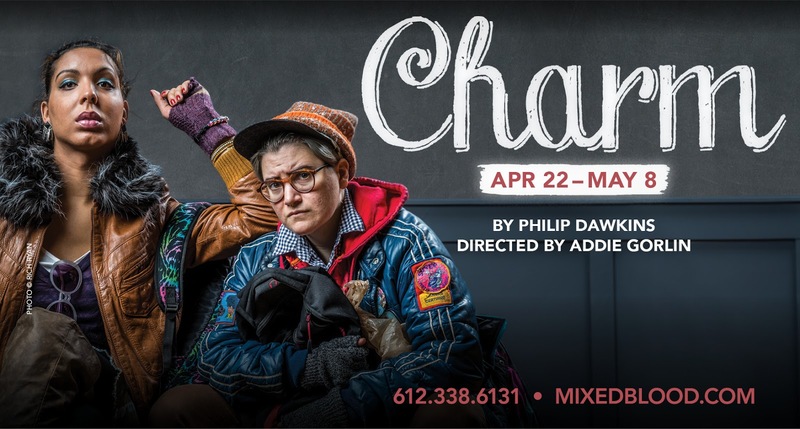 Mixed Blood Theatre's work often checks all of the above boxes, as is the case with the new play Charm by Phillip Dawkins. * Inspired by the true story of a transgender woman who teaches a charm school to homeless and at risk transgender youth, Charm premiered in Chicago last fall, but Mixed Blood's production is the first to include five transgender actors in the cast, which lends an air of poignant authenticity to this moving, funny, and at times difficult story. Affectionately known as Mama by her students, former nurse Darleena (Julienne "Mizz June" Brown) volunteers at a LGBTQI center in Chicago, teaching the students charm, or manners. But her students don't immediately embrace her, many of them just showing up in the hopes of free food. Each has his/her/their own story, often including which pronoun to use and the journey they've taken or are taking to get there. Students include the glamorous older (i.e., in her 30s) Ariela (Rehema Mertinez), playful college student Jonelle (Alyssandra Taylor), homeless married couple and parents Victoria (Jennifer Waweru) and Donnie (Ryan Colbert), former gang member Beta (Jay Simmons), possibly autistic Lady (Jay Owen Eisenberg), and curious gay college student Logan (Nathan Barlow). In addition to dealing with her students' issues, trying to help them and get them to listen to what she has to teach them, Mama also faces opposition from center director D (a natural Meighan Gerachis) who questions some of her teachings. And understandably so; why should these kids struggling with gender identity be taught about the proper way for "ladies" and "gentleman" to act, forcing them to pick a side? But in the end, what Mama is teaching them through Emily Post's rules is confidence, self-love, and respect of self and others. Addie Gorlin's direction is an exercise in organized chaos, with characters talking over and at each other in the way that a rowdy group of teenagers does. This cast really works well together and have developed an obvious trust in each other. It's a pleasure, although sometimes painful, to watch each character's journey as an individual as well as their collective journey as they form a community around Mama Darleena. Charm is a powerful story of compassion, community, and believing in people so that they'll learn to believe in themselves. These kids' lives are not easy, which unfortunately reflects the real life experiences of transgender youth. Kudos once again to Mixed Blood Theater for their fierce dedication to diversity and inclusiveness, and to representing our whole wide beautiful world on stage. 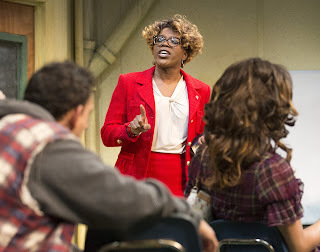 Charm continues through May 8, and post-show discussions are held after every performance to give the audience an opportunity to work through what they've just experienced. Some pretty profound things came up last night, which serves as reminder of the power of theater in general and of Mixed Blood's work in particular. *Philip Dawkins' play Failure: A Love Story was presented at the Minnesota Fringe Festival a few years ago, and is perhaps my favorite Fringe show ever. His play Le Switch can be seen at the Jungle Theater this summer.